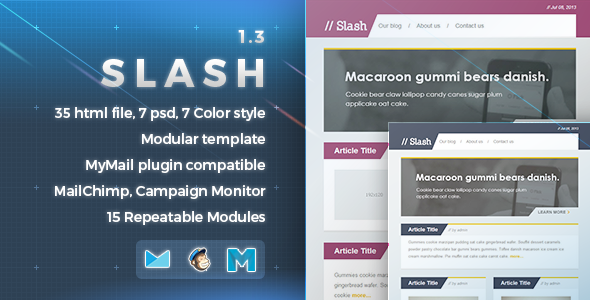 Slash a flat design email template. with 7 different color style to suit you business. with an extra header detail next to the main title you can include a little date or article writer name to make your title look more interesting. I also provide 1 extra psd file for you to easily make a image with placeholder as you see in the live preview. 7 html for Campaign Monitor – include Campaign Monitor tag : singleline, multiline, editable, repeater, layout. 7 html for MailChimp – include MailChimp tag: mc:edit, mc:repeatable, mc:hideable, mc:mc:variant. 7 psd file +1extra psd for placeholder image. Documentation – include how to upload to Campaign Monitor and MailChimp, Mailster, StampReady, and FAQ section. Revamp code structure all files. +27 more html file for 3 color.